Burning bush has spectacular fall foliage, but this fact does not keep the shrub from being one of the most hated plants in America because it is both invasive and poisonous. For most of the year, the cork-like strips that form the outer ridge of this plant's branches are its chief selling point. But all of that changes in autumn, when these great fall-color shrubs put on a fall-foliage show for the ages. The fall-foliage color ranges from red to pinkish-red, and the shrub also bears reddish-orange berries in autumn. Learn how to grow this controversial bush in a controlled manner, plus what alternatives exist in case you decide against growing it. Burning bush makes a great specimen plant in autumn, even when planted singly. But it is at its most spectacular in mass plantings, forming a sea of red in fall. Moreover, the corky ridges along the plant's new branches hold snow, making the shrub not only a fall standout but also one that affords winter interest in the landscape. Before its invasive nature in North America became widely known, states in the eastern United States sometimes installed mass plantings of it along roadsides, whether for erosion control or simply for its ornamental value. If you wish to check this spread, it will require additional landscape maintenance work on your part. The suckers should be pruned off whenever you find them. To halt any spreading via seeding, handpick the berries as soon as they form (which means, of course, sacrificing their ornamental value). 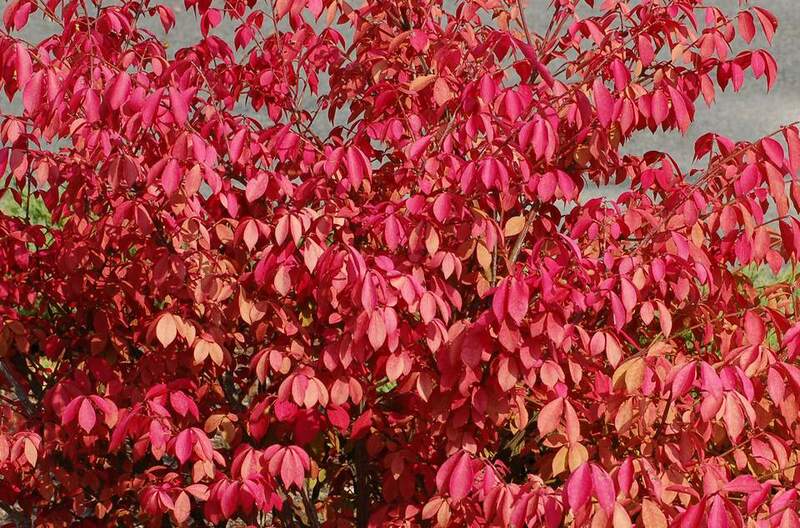 Grow burning bush in full sun to get the best fall-foliage color. Try to find a placement where it will get at least six hours per day of direct sunlight. Burning bush prefers well-drained soil and can tolerate all soil types but heavy clay. It prefers slightly acid soil but will grow in alkaline soil. The burning bush will need regular and deep watering after it is planted during its first year to encourage deep roots. Once it is established, it generally will get enough water from rainfall and not need supplemental watering except during drought. This shrub is cold-hardy to USDA plant hardiness zone 4; the southern end of its range is usually listed as zone 8. Mulch can help keep the roots cool. Fertilize it with a complete fertilizer in spring. Use 1/2 cup of tree and shrub fertilizer for each plant, sprinkled around the root area and raked into the soil. Various cultivars and brands exist, including the compact (and supposedly compact) types. "Pipsqueak" is compact at 5 feet tall. "Compactus" is less compact, sometimes reaching 8 feet tall. "Apterus" lacks corky ridges altogether, offering smooth branches. "Monstrosus" has extra large corky ridges. Pruning is not necessary, but aesthetic tastes do, of course, vary. Some homeowners prune burning bush (it can even be seen occasionally growing in well-maintained hedges) to control its size. Others, who do not wish to spoil the plant's natural shape, do not prune it, instead giving free rein to its natural branching pattern, as they would for forsythia bushes, for example. The berries, bark, leaves, and seeds of this shrub are suspected to be poisonous because those of closely-related species are poisonous. It best to keep away cats, dogs, livestock, and small children who might be tempted to see what the berries taste like. The Canadian Biodiverity Information Facility notes that warnings often pertain to related species and there aren't documented cases of poisoning due to burning bush itself. Seek medical or veterinary attention if you suspect ingestion. This alien forms dense thickets in eastern North American forests and can out-compete native plants and take over an area. Some Northeastern U.S. states (Massachusetts, New Hampshire, and Connecticut) have banned the importation of burning bush.